Ever fancy just getting away from it all and spending some quality time with your horse? Need some fun? Well perhaps you should try one of our camps! It's a great way to experience some intensive tuition from great instructors in a beautiful setting with fabulous facilities. Meet up with old friends or make some new ones. 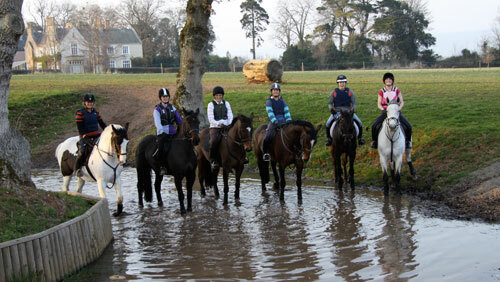 Our residential camps normally start on Thursday evening and run until after Sunday lunch and includes five lessons in small groups with your instructor to include cross country, showjumping and dressage lessons. Our instructors are thoroughly vetted and people are grouped according to ability and experience in order that everyone gets the most from the sessions. We normally arrange for a photographer to attend so you can have a great reminder of your achievements and fun. So whether you've a young/ inexperienced or new horse, or have more experience, the courses range from 1'6" to Intermediate, so camp is suitable for you. Just look in our previous newsletters and you'll see reports from some of this year's first timers which will give you a flavour of their experiences and I'm sure you'll be wanting to join us. Residential Camps are suitable for those walking, trotting, cantering and wanting to do some jumping – even if that's a pole just off the ground up to those who are British Eventing as the courses cater up to Intermediate. If you wish to have further information or put your name down then please email bathridingclub@hotmail.com and put CAMP in the Subject title.